Are you required to post your objectives? I was looking for a way to make this easy to do and I found it! A couple years ago I created an objectives bulletin board and it was ruined this summer during my move to my new classroom. My original display took about six hours to make with my Cricut. I decided to remake it this time with my new clip art that is perfect for this project! To create this bulletin board, I cut out the headings and glued them onto my scrapbook paper. I then laminated the whole sheet and adhered a sheet protector where my objectives will be slipped in. Doing this is much easier to do than writing them on the board every single day. The beauty of the headers being separate is that they can be attached to any color scrapbook paper to fit any color scheme. These objectives were created by Debbie Crockett. I love them because they include a student friendly version on top and the CCSS on the bottom for me to reference to. You can find her sets HERE. This year I decided to display them differently. Instead of backing them with scrapbook paper, I am hanging them up with some book rings. I go through the objectives I need for the week and I just flip through them to display the ones I need for the day. This makes everything so easy! I received several requests for the set, so it is now in my TpT shop. 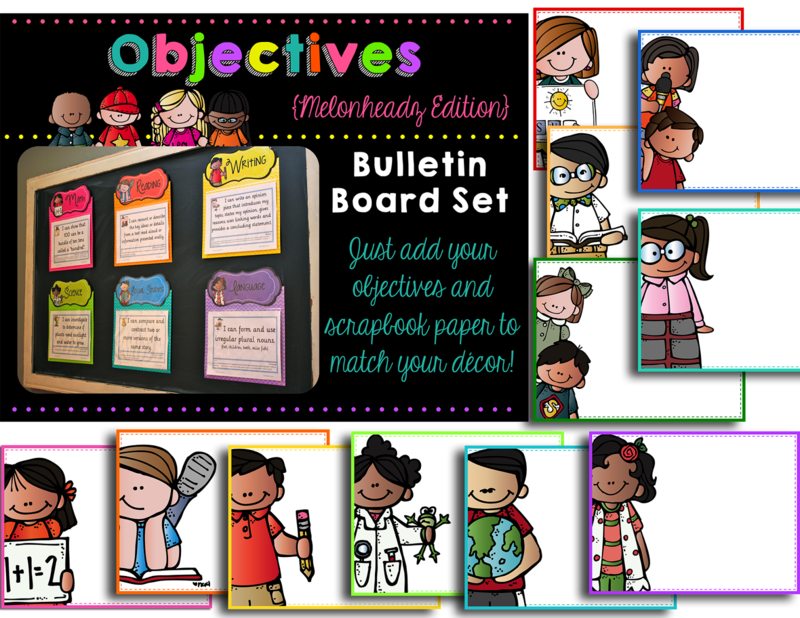 If you are interested in this set of headers and editable objectives posters, please click HERE. I really like the headers. What a great way to stay organized. Thanks for sharing about it. Your objective posters look amazing. The black background really makes them pop. This is such a great idea because I agree that writing them up on the board each day gets really tedious. I adore those objective headings! I might be getting some for the upcoming school year ;) (I have to check how much space I'm working with since I will be in a new school) They totally match the theme I have in mind. These rock! Hi! 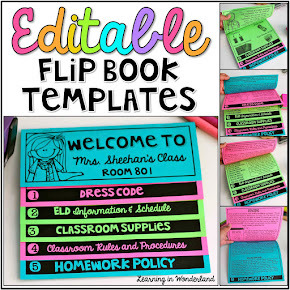 Do you have these headers available for editing or with grade levels (one grade level for each color?) Red- Kinder, Orange -1st, Yellow 3rd, etc etc (with PreK, SPED also)? I am an elementary music teacher and would like to do something like this for my objectives board in my classroom. It won't let me view the video for some reason, I love the new binder clip idea to change out the posters! How did you stick them to the wall? I can't tell, is it a tack? Melonheadz Goodies for Monday Made It! 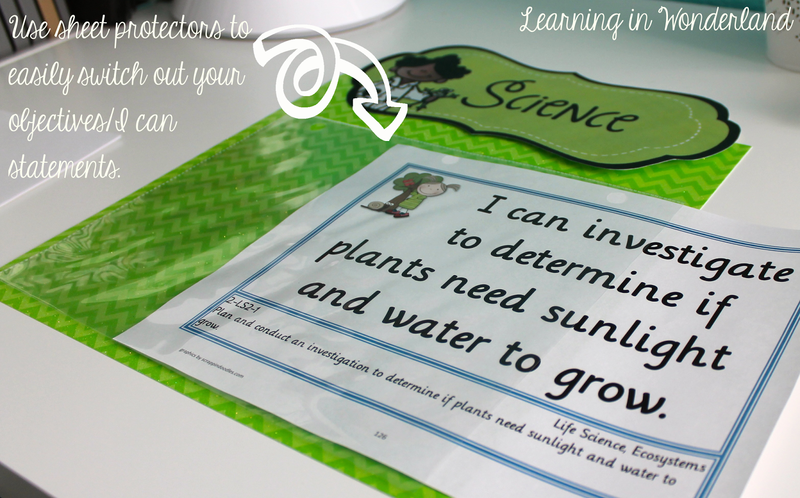 Classroom Decor, Pigeon and More!